PW AA: Trials after Justice Progress report! Current contributer: FerdieLance is working the game engine on PyWright. Various artists contributed B/W pictures. Rina-Chan has voiced Maya. Scripting: Starting script of Episode three: Turnabout Daredevils. Spriting: Can't draw sprites anymore, but have a way of getting it done. Will require lot's of editing. Status: Two Turnabouts done! Two more to go! What I have: Well, you may have seen some of my sprite’s in the sprite thread. If not click on the link under my sig and have a look see. I suppose for now I’ll give a synopsis for each of the 4 cases. ATTENTION: You need PyWright to play the game! Unzip game and put in PyWrights game folder. Ep. 1: Checkmate and Turnabout. The basic tutorial trial, for the game. Maya, is the replacement attorney for Phoenix. As he’s, unfortunately, slept in and will be late to the court house. Maya is to defend a painter, who is accused of strangling someone whom he was painting. Phoenix is asked to represent a custodian, by a fellow employee. The custodian is accused of stabbing a student. Along the way, he face’s a new prosecutor, ex-Navy Lieutenant Hawk, who doesn’t approve of the way Phoenix has handled some of his cases. Ep 3: Turnabout Daredevil’s. Dragged to a stadium event by Maya and Pearl, Phoenix takes the case of a stunt driver, who is accused of robbing a bank, and hitting and killing a pedestrian with their vehicle, all while unveiling a secret plot against the defendant. Along the way, Phoenix discovers a little more of Hawks past, and finds out his true character. Ep 4: Turnabout Legends. Phoenix and Maya are invited to a celebratory dinner at a Navy base. But murder and mayhem is the only thing on the dinner menu. (CHEESE) Gumshoe is accused of murdering a Navy Captain, leaving it up Phoenix to defend the helpless Detective. In an epic trial, the truth must be uncovered and a past trial revealing Luis Hawk’s secret will be discovered. But with a case with so many unanswered questions Phoenix will need his friends to help him find the truth of this dark case. Last edited by SilentBobX on Thu Apr 24, 2014 6:28 pm, edited 97 times in total. 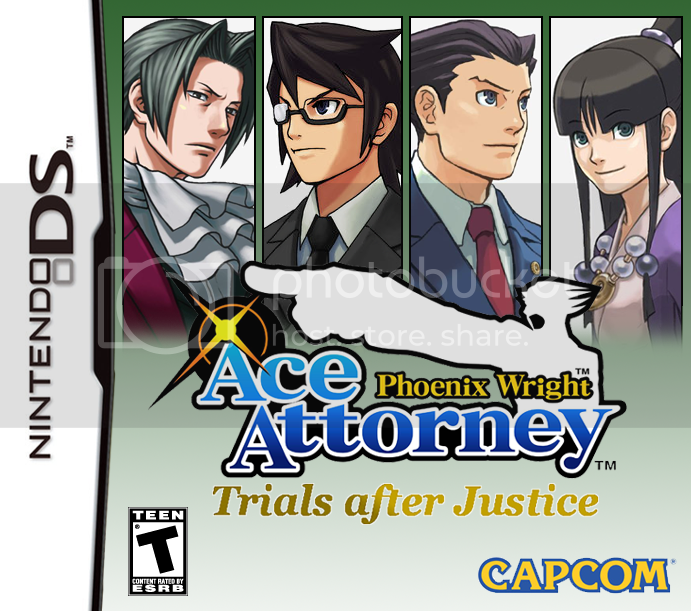 Re: PW AA: Trial's after Justice. You don't really need a tutorial, we've played the games. Depending on the case maker you choose, I might or might not be able to help. I saw your sprite thread that you need an animating program. People want their fangames to be as realistic as possible. Or Turnabout and Mate. I think that's a bit better sounding. If you decide to use PWLib, I can help with tips and info as needed. Yeah, what he said. Maya'd make a good canadite for Rookie attorney for a tutorial case. There's a good reason for the title name. You'll just have to wait and see, what it'll mean then. Unfortunatly, PWLib is too complicated for me to use. I don't have to know how on using script type game program like that. I don't know if i'd be able to understand that stuff. Though if there's an easy to understande method, i'm all ears. I think I need to find a Voice actor for Lt. 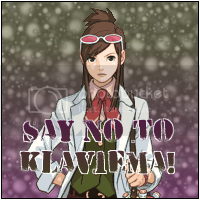 Prosecutor Hawk, and have him make me a voice file saying OBJECTION. I already have some for Maya. They were made by Rina-Chan. Also, please do not take these without permission. Last edited by SilentBobX on Sat Jul 18, 2009 8:50 pm, edited 1 time in total. I think the easiest method to learn PWLib is to talk to me on MSN (since I can kill any doubts in real time). I got sidetracked by video and other stuff, so Shinku isn't done yet (it would make PWLib a lot easier). I can say that anyone can understand AHLSL (thus PWLib) given a bit of time, some motivation and someone helping. It looks hard at first, I won't deny it. Thank you very much, KSA_Tech, but unfortunatly, i don't think i'll be able to learn something as complex as PWLib. Although I do very much appriciate that you were willing to have a sit down with me and talk me through some of it's features. Time, as you say I needed, isn't somthing I have though. I have a Stressful job that keeps me from my computer and I also need some of the Extra time to go and Sprite some new characters (plus I have a Webcomic to run on the side as well. ). I think PyWright might be a good program for me to use. I just need to learn how to use it, as it looks the easiest. well if you do not have the time, you could pass the script to someone with more experience and ask them kindly to code for you. Wouldn't be too hard for me, all I would need is a script to follow so I know how the game is supposed to act, it only took me 29 hours to do Case 1-1 from Gyakuten Saiban 1. Hmm, that doesn't sound like a bad Idea at all. I'll come up with a Test Trial Script and see what can be done with what I have. Unfortunatly, I got a Nasty Virus in my hard-drive, and it'll need replacing. Would you be up to it in the near Future, DDRKhat? I don't want to take time away from you if you're busy. We have official Art of Luis hawk! It's kinda awsome to see Luis drawn out this way. ^^ All I need is a Gruop pic and maybe we can get a Trailer for the game going. Looks really awesome, wish I could draw like that :D If you need a voice-actor for him, I could record my voice if you like. I already have someone to fill in the Role of Luis, But thanks. AADS will be out in BETA quite soon. There is no scripting for AADS. Just user input. Scr1Text=OBJECTION! 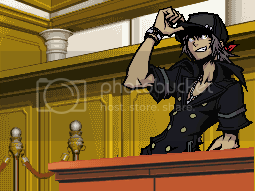 will place Objection on the screen. AADS's 'scripts' are just variables that you define to make a game. It's quite easy to figure out, I'll show it to you after it's finished. Your sprites will also be embedded in the ROM, so you will be able to just define the animation variable with your sprites' animation IDs to call them onto your screen. And remember DDRKhat mentioned helping you with the coding part. I can get the sheets in usable format for PWLib simple animation if you want to as well (DDRKhat asked me o generate the sheets some time ago). Oh, the Trouble I could have caused If I said it was official GS5 art! The name of the person who drew the picture for me name is Mazjojo. It was his first time drawing Ace Attorney art, so I sent him some reference art Of Phoenix so he could get the style down. I dicided to make a Box art for the game, so I had a little fun whipped something up. You can see it on the first post. 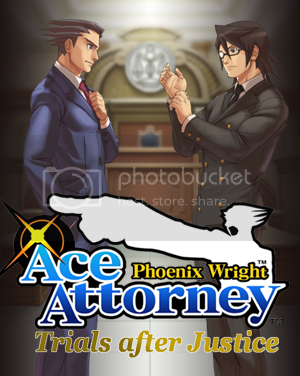 BTW Can anyone make the "Trials after Justice" under the Ace Attorney logo. That'd help alot. I can do that. What kinda style text do you want? That okay? It should look better when you downsize it to fit on the cover. That's good. Thanks you very much Random. I'll apply it as soon as I can. Edit: man.... that cover is Sooooo awsome now. If you need it, I could animate the sprites. Why is it that one of his lenses is opaque and the other is transparent? Yes, except he not a Killer like 'ol Kristoph is. I didn't have much reference to give the artist, so he just took what was on my sprite sheet, and he came up with what he could. I kinda like it. Double-Glasses Shading (Non-White): Good, but will turn evil. The more evil the color, the more evil s/he will become. Double-Glasses Shading (White): There will be a plot twist involving this character. No Shading (No other characters have shading): You can't tell, because the artist may just not like glasses-shading. I've gotten some Artists together to help with B/W pictures for my game. I have one I'de like to share: the crime scene photo for the first case. Very well done. Only problem is the flat table and chair. Also, the assistant Phoenix from your avatar is good too, you should submit it to C-R.
We now have a B/W scene told through the view of the witness, as re recalls events from the first case. As far as progress on the game is going, I've almost completed the script for the first half of the case. After that, I need to input the actions and such and send them to DDrkhat. Where do you get the people to make these awesome images?! Aheh heh, I scoured Deviant Art for some worthy artists. Of course this also means I have to pay them, which isn’t so bad, since I got ALOT of money anyway. They're all very helpful, so it's very much worth it. Alright folks. SilentBobX here to ask for some much needed help. First a progress report. I finally have the first script written up for case 1-1 of “Trials after Justice”. All I need to do is proof read it, and that’ll be it. Now, the next part is choosing a casemaker to help make this game. Unfortunately, I’m at a loss at what to choose. I DO NOT for the life of me know how to go about programming, type codes or whatever. I CAN’T do it. PWLib would probably kill me, and I’ve strained myself trying to learn PyWright, only to get large headaches... I’m just not able to do that sort of thing, which is why I’m asking for help. Now, I know DDRKhat said he would be able to, But I’m not sure he’s able to since he seems to be busy when I contact him. So as not to get in his way with whatever he’s doing, I’ll try to ask someone else. What I couldn’t do, that Khat asked me to do, was to put in the actions for the game in the script. Things like, Flash’s on the screen, Screen Rumbling/shaking, blue text, red text, Courtroom, background commands and sprites that had to be used here and there, ect. And know this is something I need to do, but ATM trying to find time to type things like this up is very taxing on me. It’s the end of the school year, and my job gets harder in the summer and that gets in the way of development. Trying to find time to make Sprites is just as hard. So, yes, I’m pleading for help in this area. I seriously need help from someone who can help put together this case with adding in action and such. I know it sound like I’m acting lazy, trying to put this kind of effort on someone else, But if I could do it myself I would. I wish programming was easier but it isn’t and I know all the kinds of hardships it must take to put a game together. So if anyone out there can lend a hand in this particular area, and if you can help me create a case using whatever casemaker you think might work, please contact me. It would be very much appreciated if you could. I’m sorry if it sounds like I’m being selfish with my request, But I just don’t have the proper time to do some of the tedious things, and am in dire need of help. First a progress report. I finally have the first script written up for case 1-1 of “Trials after Justice”. All I need to do is proof read it, and that’ll be it. Now, the next part is choosing a casemaker to help make this game. Unfortunately, I’m at a loss at what to choose. I DO NOT for the life of me know how to go about programming, type codes or whatever. etc. Hm. Well, I know NOTHING about PwLib and any game programming software. All I can help with is the animating and the scripting. Hey. I got you some Finn Gerpain sprites. Are you going to need the side sprites of Finn yet? You HAVE tried AAO, right? Nah, I wanna try for a professional look for the game. That and you have to use Firefox for that site. I hates that Firefox. No worries, The person making the music for me may have found someone who can lend a hand with programming. Whenever you can get to them, so take your time.